As we celebrate Memorial Day this year, we must not to forget the men and women of our armed forces who gave their lives defending our nation and our way of life. As patriotic Americans, the IAM family has strong respect for our nation’s lost heroes. Although some may take for granted the freedoms we all enjoy, they came at great cost and sacrifice. Many of our members actively serve or are military veterans. Tens of thousands of Machinists work to support our armed forces at bases, arsenals and factories across the country. Please enjoy this holiday weekend and I hope you will display our nation’s flag with pride, in honor of those who made the ultimate sacrifice. 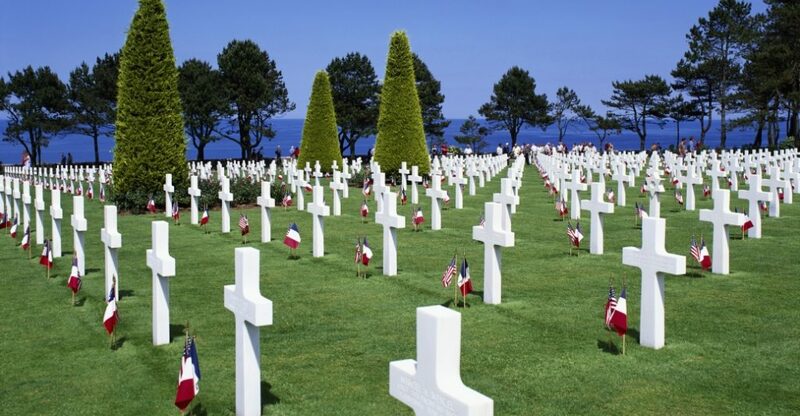 The Normandy American Cemetery and Memorial in France is located in Colleville-sur-Mer, on the site of the temporary American St. Laurent Cemetery, established by the U.S. First Army on June 8, 1944 as the first American cemetery on European soil in World War II. The cemetery site covers 172.5 acres and contains the graves of 9,387 of our military dead, most of whom lost their lives in the D-Day landings and ensuing operations. On the Walls of the Missing, in a semicircular garden on the east side of the memorial, are inscribed 1,557 names. This entry was posted in Uncategorized on May 30, 2016 by IAM&AW Local 24. Happy Birthday IAM. Looking Good at 128. IAM members attending classes at the Winpisinger Center today were treated to a cake commemorating the 128th anniversary of the founding of the Machinists Union. 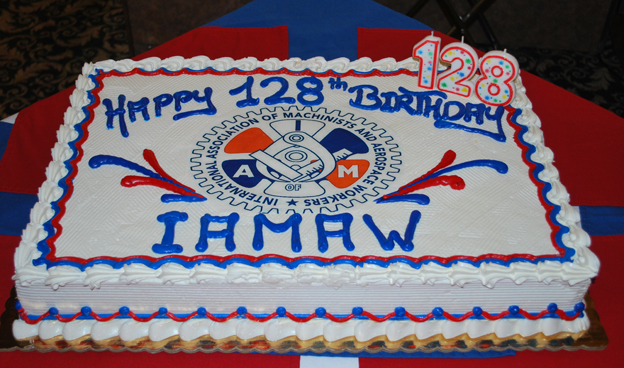 IAM International President Bob Martinez issued the following statement commemorating the 128th anniversary of the IAM’s founding: “May 5 marks the 128th anniversary since 19 Machinists met in secret to create the organization known today around the world as the International Association of Machinists and Aerospace Workers. “It’s an occasion to celebrate the ability of this union to endure and survive every manner of economic and political hardship, from world wars and global depressions to political attacks aimed at terminating our very existence. This achievement required tenacity and sacrifice from literally millions of men and women who believed that our union and its members were worth fighting for. “This day is also an occasion to rededicate ourselves to the cause of justice in the workplace that remains under constant attack today. Despite great technological advances that have transformed workplaces across North America, we still face a corporate agenda that values profits over people and constantly seeks to suppress workers’ voices. “I ask each and every member of this great union to pause today, be proud and consider our responsibility as beneficiaries of 128 years of victories, struggles, setbacks and ultimately survival. I am totally confident we are worthy of our legacy and equal to the challenges ahead. For more than 120 years, the IAM has fought for workers’ rights and the benefits so often taken for granted. Benefits like sick pay, leaves of absence, bereavement leave, holidays, vacations, retirement security and healthcare. Our Union started 128 years ago in a locomotive pit in Atlanta, Georgia. On May 5, 1888 19 railroad machinists met in a locomotive pit in Atlanta, Georgia to form a trade union that would become the International Association of Machinists. They appoint Thomas Talbott as their leader. 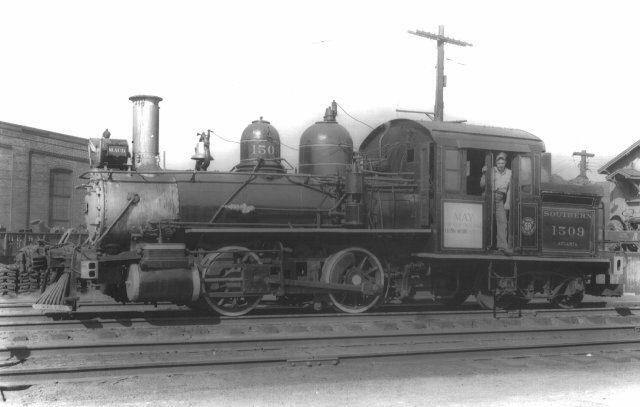 At the time railroad machinists earned 20 to 25 cents an hour and worked a ten-hour day. Most of the Machinists Union’s early organizing was done by men known as boomers. These journeymen were known as boomers because they followed the railroads to towns that were booming. The boomers were part hobo, part skilled craftsmen. Often boomers had to communicate by a system of secret passwords or signals known only to other machinists. Union organizers not only risked firing and blacklisting but beatings and jail. The old-time boomers accepted these risks. The boomers established local lodges in areas where they were not already present. Within one year there were 40 lodges, and by 1891, there were 189. Today the IAM is a large and diverse organization, representing 720,000 members across North America. The IAM is one of the largest and most experienced unions in North America. You will find Machinists in aerospace, transportation, the federal government, automotive, defense, woodworking and several other industries. We represent workers at companies as diverse as Harley-Davidson, Southwest Airlines, Boeing, Pratt & Whitney, Freightliner, Tennessee Valley Authority and the Bureau of Engraving and Printing. This entry was posted in Uncategorized on May 6, 2016 by IAM&AW Local 24. This entry was posted in Uncategorized on May 1, 2016 by IAM&AW Local 24.